These books are my favorite recent publications in this field. They offer insights, research and results to stimulate our creative movement forward. Love: The Final Frontier is the introduction to Part One of Marci Shimoff’s broad and deep look at Higher Love. She is a clear, easy to understand writer who manages to appeal to both the uninitiated and the advanced practitioner of human evolution. I really enjoyed and learned from this book. In Part I she helps you assess where you are on the Love Continuum, from No Love (hate, fear, resistance) to Love for Bad Reason (filling a void), Love for Good Reason (healthy relationships) and Love for No Reason (inner state of pure love)- moving from Conditional to Unconditional Love. To access unconditional love has always been a high aim in spiritual development and not something you would learn about on the mainstream market. But Marci makes this not only understandable to the average person but desirable and attainable through her brilliantly organized approach to this ancient topic. She debunks many myths about love and brings in many “Love Luminaries” those adept at practicing Higher Love, some well know teachers, who share their approaches; giving simple to quite advanced methods and exercises for moving through the blocks and hindrances to finding the keys to being in a loving state. The well chosen stories that accompany the chapters, open the heart and reveal secrets of high quality living and loving. An innovative view of the body’s 7 energy centers (chakras) as doorways to aspects of love, helps the reader to expand their capacity for awakening the natural love that exists in all of us. This book is a great companion for expanding your ability to love for no reason. Highly recommended. A real investigative journalist, Lynne McTaggart does a thorough job offering a completely new, scientific story that challenges the way we have conceived of ourselves and our world. The Bond shows that the essential impulse of all life is a will to connect rather than a drive to compete. With densely packed New-Science research written in a lively and interesting way, she shows how we are actually connected, hardwired to each other in many interesting and unexpected ways. It is easy to recognize once the key is presented. Most interesting is how we become in sync on many levels when working together to achieve a common goal that everyone really wants. Obvious in sports teams and other situations that we have all experienced. Along with insights, this book provides ideas and examples to help foster more holistic thinking, more cooperative relationships and unified social groups. I like Lynne’s investigative work and have followed her for years, reading her other paradigm shifting books, The Field and The Intention Experience. I also joined her Teleseminar called The Fairness Summit where she interviewed many New Thought leaders. These interviews were enlightening and important. They can be purchased on the net at her website, although the price is steep, which I am sorry about since they have excellent material that should be heard. 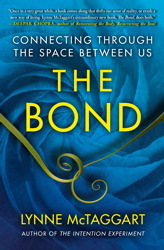 But if you like scientific explanations for new theories, the Bond is the book for you. Her ideas are revolutionary and evolutionary. Hopefully many will listen to them. Karen Armstrong draws on a wide range of material in this book, not the least of which is contemporary neuroscience! Like Lynne McTaggart she finds evidence that compassion is hardwired into our brains although restrained by our egocentric tendencies which are learned through our current cultural orientation. This underlines the fact that working with our own personal development is an essential key to transforming the current culture of selfishness and greed that we see around us. 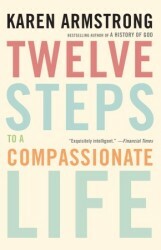 To counter this tendency, the book provides a carefully crafted map: Twelve Steps to a Compassionate Life. The names of the steps give simple clues as to what is important for an evolutionary development in this area. These steps speak for themselves: Step 1 = Learn about Compassion, Step 3 = Compassion for Yourself, Step 4= Empathy, Step 5 = Mindfulness, Step 8= How Should We Speak to One Another? Step 9 = Concern for Everybody, Step 12 = Love Your Enemies. The other steps build on these and bring in deeper understanding, knowledge and action potentials in daily life. Starting with Compassion for Yourself is a major evolutionary step. We can only give to others that which we have ourselves. Learning to Love Your Enemies is the most difficult of all the steps and must follow the others. Karen Armstrong in her own compassionate way, emphasizes that practising these steps will not change our lives overnight and that this is a difficult project. Yet she argues that compassion is inseparable from humanity, and by transcending the limitations of selfishness on a daily basis we will not ony make a differenc ein the world but also lead happier more fulfilled lives. Extensive notes, suggestions for further reading and a comprehensive index make this a well researched and scholarly text yet easily accessible to the ordinary reader. It would make a perfect guide for a study group wanting to support each other in developing this evolutionary quality. An evolutionary trend we are beginning to see is the coming together of apparent opposites, a holism, which both balances and heals. This book is a perfect example of that movement. Adam Kahan is well known for his facilitation work with some of the toughest and most complex social challenges around the world. His reputation started when he facilitated the Mount Fleur Scenario Project to help transition South Africa to a democracy in the 90s. The authenticity and humility that Kahane expresses in describing his journey through power and love, makes this a transformational book. His own struggle, his own successes and failures are grist for the mill of his understanding. The result is what he calls A Theory and Practice of Social Change, achieved through balancing Power and Love. He uses Paul Tillich’s definition and approach to these words.. The focus on the what and why power and love are, rather than what they enable or produce. Power is seen as the drive to achieve one’s purpose, to get one’s job done, to grow. And love as the drive to reconnect and make whole that which has become or appears fragmented. He thus takes us beyond the more common ideas of oppressive power and romantic love as represented on the cover of the book by the grenade and the rose. We gain a new level of understanding and recognition of the forces that often block successful social change. These are not just words for him. He puts them into the context of his own life and work, unmercifully exposing his own process for our benefit and brings the concepts home. The conclusion: ” To Lead Means to Step Forward” is a bold and enlightening treatise on leadership, with sections called: Becoming Aware of Both our Power and Our Love, Balancing Ourselves and Practicing Moving Fluidly. This book had a deep impact on me and was a delightfully interesting read. This is a beautifully written and engaging book that gives not only a clear idea of how to use the circle framework but a sense of a potential for a leap of consciousness for all who engage in this form of speaking together. “If we change the chairs, we can change the world.” These words show how much the authors believe in the power of the ancient social process of sitting in a circle. And they know what they are talking about, having nearly two decades of experience bring circle practice into organizations of every kind. I know Christina and Ann personally and have myself participated in one of their Circle Intensives as a training for people working with the Art of Hosting. Not only is their skill as circle facilitators evident, but their authenticity and integrity as people committed to contribute to increasing conversational literacy tor addressing today’s complex and challenging issues. In addition to having clear and easy to understand directions for using the Circle in a structured and constructive way, what I found so interesting about the book is the stories that they use to illustrate their intentions. Sharing stories is actually one of the methods that they name as the core of communication and this becomes obvious through the inspiration and insights that the reader gathers from their examples. Here is a taste of some of the goodies you will find in this book: Ch 1: Where Circle Comes From and Where It Can Take Us – Ch 5: Accountability Through Agreements, Practices, and Principles – Ch. 10: Circle as Support for Collective Healing – Ch 11: Organizational Experiments in Circle Governance. 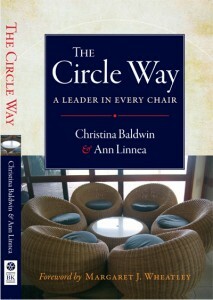 A quick overview of the praise for The Circle Way gives a clear picture of the depth and breath of influence these two woman have brought into the world. Such a gift to read this book! 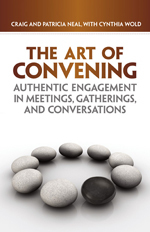 Authentic Engagement in Meetings, Gatherings and Conversations. This is a perfect companion book to The Circle Way as it supports the development of the one convening (whether it be a circle or regular meeting) to truly prepare themselves for the task of bringing people together to create something. This area has often been totally overlooked in both leadership literature and in meeting effectiveness literature. In a clear and structure format, this book helps the reader to understand the important role the person convening a meeting has in ensuring the success of a gathering. This is not a book of recipes but rather a guide to deepening your understanding of what it means to have authentic engagement with another or others. It offers a set of practices and principles that will bring an integrated, whole-systems dimension to those who use them. You could actually say that this book is really about leadership development and personal development. Yet it is done in such a simple and clear way that the reader is naturally led to their own wisdom through reflective questions and concrete examples of how it all works in practice with pitfalls and success stories. The steps on this journey are mapped out in a developmental wheel leading us gradually to a mastery of the Art of Convening. Each aspect of the way illuminates 1) the Challenge or barrier that must be seen with this aspect, 2) the Principle or foundation value of this aspect, and 3) Essential Questions that one asks in this Aspect. The book then address each of the 9 aspects of the Convening Wheel, moving from the aspects that address the inner issues of the attitude and values to the outer issues of logistics and practice. An overview of the Wheel in an abbreviated form: 1 Heart of the Matter: who am I in relationship with others. 2 Clarifying Intentions: alignment of intention and purpose. 3 The Invitation: sincere offering to engage. 4 Setting Context: Communication of the form, function, and purpose. 5 Creating the Container: physical and energetic field of the meeting. 6 Hearing All the Voices: Each person speaks and is heard. 7 Essential Conversation: meaningful exchange in atmosphere of trust. 8 Creation: something new that emerges and 9 Commitment to Action: responsible and accountable for the way forward. This book gives insight into the essence of being a leader; as a convener with the ability to help people communicate in a generative way, whether in a position of authority or an ordinary person wanting to inspire and connect others to accomplish something for the greater good. This is a different kind of service – that of connection. This book is a key book for evolutionary development in business. Carol is considered one of the more potent action-learners on our planet. Her keen mind exposes connections that we ordinarily miss in our fragmented approach to life and business. Learning to connect the dots seems to unleash a powerhouse of innovation and motivation with wide consequences. She doesn’t give easy recipes for success but clear maps for getting on the right road and staying there. Her key teachings are 1) learning to look at all the key stakeholders (including in these The Earth) as a connected system, showing leverage points for big multiplier effects and 2) turning people around through personal development and critical thinking skills (with ideas about how to do this) and 3) looking at the big picture of responsibility by turning it into the DNA of the company. Each chapter ends with a summarized “Conclusions” box and a free download of the key elements in the chapter. Other free downloads include: a guide for personal reflection and action, to increase the level of consciousness in personal and family life and study guide to be used in educational settings on all levels. All of the approaches in this book are revolutionary; not quick-fixes or recipe-oriented, yet certainly inspiring with the over-the-top results they create. A very interesting chapter is a review of today’s most successful companies in light of her key teachings. Definitely a wake-up call for businesses today. As I have become familiar with her approach, I begin to discover others pointing in the same direction. There is a quiet evolutionary movement going on in front of our eyes. 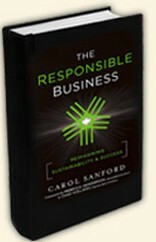 This book could change our conversations about business and help us to establish a responsible relationship with the Earth. An inspiring and practical guide to the future of business. See quotes. A learning journey into communities daring to live the future now. This is a book that is in a category of its own! Beware: reading it may change the way you think about the world and your place in it and maybe about yourself! It challenges your assumptions around social change, traditional thinking and your view of what is possible. It is provocative and inspirational. Yet it doesn’t pressure you with ideas, it gently helps you to see things in a new way, as you go on an imaginary journey to seven communities around the world that have walked on to a new way. You get to meet people who have walked out of limiting beliefs and assumptions and walked on to create healthy and resilient communities. You watch how they transform situations that seem hopeless or impossible. I encourage you to take the journey to Mexico, Brazil, South Africa, Zimbabwe, India, Greece and the United States. Travel slowly. Reflect often. Notice. See the shifts: from power to play, from problem to place, from efficiency to resilience and more. Notice the theme underlying the whole book: “No one is coming to help. Now what?” Learning to trust oneself, one’s gifts, one’s contribution is learned again and again. 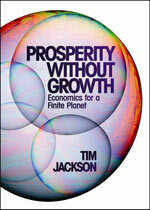 Prosperity without Growth by Tim Jackson. see another review of the book. There are many new books appearing about alternatives to the current economic model. Since finance isn’t my profession, I can only try to get a general idea about different potentials. What grabbed me about this book is the recognition that growth is difficult on a finite planet. 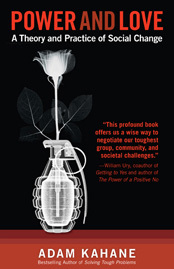 I found the book holistic in its approach and optimistic without being fanatical. He gives some clear ideas of how to flourish within limits and recognizes that a transition to a sustainable economy must be approached realistically. I was surprised and enlightened with his psychological approach to another aspect of addressing solutions to the current economic problems. He points to what he calls “the social logic of consumerism” as a key issue to be considered. Looking at the way in which material goods are deeply implicated in the fabric of our lives, he examines the fact that material goods provide a vital language through which we communicate with each other about the things that really matter: family, identity, friendship, community, purpose in life. He presents some interesting thoughts for reflection about this issue. This is a topic that most economic treatises don’t take up and is most likely not discussed in Economic 101, yet it is a vital point to making a sustainable choice for any new system. The New York Times calls this a Bold and Provocative book and “The Financial Times” calls it “One of the best books of the year”. As a non-financial person, I found the book inspiring and informative. This book uses the metaphor of bees to discuss how the clash of differences that separate people, purpose, profits and priorities can generate fresh energy to solve 21st century problems. 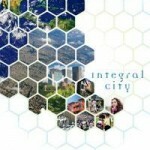 A deeply researched and innovative approach to looking at cities in a new way. Using the lens of science, ecology and systems theory she develops a new perception of the possibilities that lie in cities to support both the planet and the humans that inhabit it. This is not just an idea but also the basis for action that can be put into practice today as indeed the author has done in her own home town in Canada. This book along with the author is widely acclaimed and traveling around the world being sought after by city-planner, architects, social entrepreneurs and educational institutions, change agents and ordinary city dweller who recognize the need for new approaches to our current ways of living.. This is a leading-edge book using an integral (holistic) approach that is already considered a classic in its field. This is a big book in every way. It is a cornucopia of historical overviews, old myths that linger and affect our choices, new-science discoveries that reveal new possibilities and clarifying visual models of our evolutionary potential. Bruce Lipton, a well know speaker and author, has a background in cellular biology and was a major contributor in the field of genetics (having been involved in the epogenetic revolution). He is also an expert regarding the role of “belief” in mind and body relationship, having written an acclaimed book called The Biology of Belief. This dynamic duo creates a rare combination of hard facts and transformational humor, giving the reader a fascinating ride into new and old territory. Despite many in-depth scientific descriptions, facts and figures, references and footnotes, models and mind-stretching concepts, this book reads like a mystery novel, hard to put down, both funny and surprisingly enlightening. Perhaps a review of some of the comic quotes from “Swami Beyondananda” at the beginning of each chapter will give a flavor of the approach and the topics. “…The future that emerges from this Whole New Story is so attractive that I believe it will encourage us to fulfill our true hearts’ desire for more love, more life, more creativity NOW.” Barbara Marx Hubbard. “An extraordinary and timeless gift to humanity.” Leonard Laskow M.D. 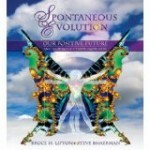 The words, “Spontaneous Evolution” is a play on the concept of “spontaneous remission” that occasionally occurs in advanced terminal conditions. “After assessing civilization’s plight using insights offered by cutting-edge scientists, we are happy to report that there are, indeed, golden opportunities hidden in the dark clouds of crisis. Those willing to face the music and dance together will be the ones who will help transform the threatening crises we face into awesome opportunities. If we develop the right capabilities, right awareness and let go of our limiting programing based on old-school myths /beliefs, the hope is that we will evolve from an identity with our individuality as human beings to a recognition of our common humanity. I wish everyone could know this full story. 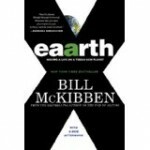 If you are at all interested in the current climate situation, you have probably heard of Bill McKibben and his passionate attempt to help us to realize what is happening to our planet. This is not an easy book. But it is an important book. When you read this book you will feel compelled to share it with others. You can feel the sense of urgency. You can see with your own eyes what he is speaking about and may find yourself rushing ahead to hear his solutions and recommendations about what can be done. When enough people in both important and lowly places understand the whys and the hows of our Earth’s new situation, we can work together to use our creativity and powers for good to secure a future for the earth and for its inhabitants. As one of the reviewers says this book will “…knock you down and pick up up.” Sometimes we need to be knocked down to realize our own capability to do something important. 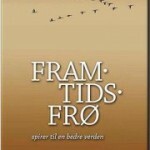 Future Seeds (“FRAMTIDSFRØ – spirer til en bedre verden”) Editors: Vidar-Rune Synnevåg and Rolf Erik Solheim. For the latest information about what is happening in Norway in this area see this website.